A very rare occasion of me actually appearing in the site photographer’s album post-bbwar. 60-70% of the time I’ll scour the pictures from a game day I’ve attended and if I have had my soul taken at all it’ll be a quarter of my back through a door way, or something along those lines. 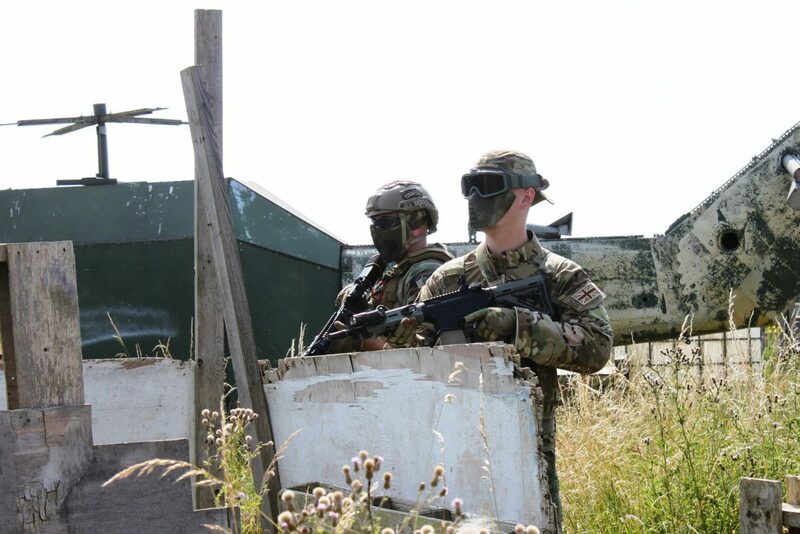 An enjoyable little skirmish at Xsite Airsoft Limited’s ‘Outpost’ site, enhanced by playing alongside my buddies Femme Fatale Airsoft and the lads from Project Cerberus. 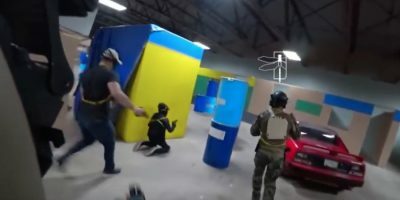 The game that airsoft is can take a lot of forms for different folks and as long as they bear in mind it is always just a game then I fully support all of them. But for myself, I really get the most enjoyment from a mixture of a modicum of sprinting around in a crazy fashion, hopefully confirming that my gear facilitates carriage of equipment comfortably alongside allowing smooth access to mags etc, but crucially the social element has to be there too. The entire game is built on the interactions between human beings and since I don’t get off base as often as I’d like or perhaps should, just being out of the military environment for a while is really a pleasant break – even though the average air force camp is the least military of military settings. The game in question was a couple of weeks back which wasn’t far off the peak of the heatwave the British Isles are currently in the midst of. I’d say tipping in to 33 degrees or so, maybe even slightly more in the direct sun being such a clear day. 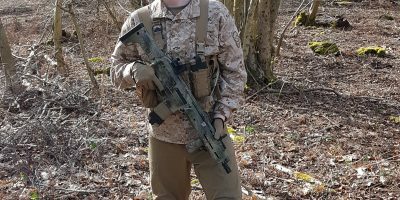 This was actually the first occasion I think ever in my time playing airsoft that I deliberately forwent carrying a sidearm or indeed any gear at all on my belt line and opted for just a primary with the bare minimum of load carriage (taking in to account I use mid-caps and usually don’t fully load them). Starting from the top, the good old (long discontinued sadly) Grey Ghost cap combined with the Turbofans/plastic lower performed really quite well given the conditions. I could’ve gone with a mesh cap of course but I’d actually been extremely stupid and gotten my forehead sunburnt a few days before, so I had to completely cover that up. I even had factor 50 on my face under the hat just to be sure. First time I’d been so careless as to get that burnt in about a decade, so definitely a strong kick up the rear end in that regard. Tried out one of the Patagonia Level 9 Next-to-Skin shirts for the first time since I fancied having the full multicam pattern to complement the chest rig. To be frank it’s just what you’d expect of a modern combat shirt that’s designed to be a bit of an all-rounder with no-melt/no-drip. Not bad in the heat but somewhat slow drying in the torso compared to other fabrics that aren’t concerned with FR. As I expected the pattern started fading slightly in the torso as soon as I washed it that evening, even with a careful hand wash which is a gentle of a wash as one can perform on clothing. The chest rig was part Spiritus Systems and part Ferro Concepts with a couple of GP pouches in the mix. Again the first time I’ve not had a dump pouch on in many years so most of the time I was just dropping mags, reloading, firing, then picking back up and re-stowing the mag back in to the chassis during a lull. Given the nature of the site and the game that was an option for me, but reload with retention would of course still have been possible, it’s just not always quite 100% ideal with the elastic inserts. Realistically the time difference with a kydex insert would not be anything significant and I’d probably still choose to drop empty mags in the given context, since the option was there. Either way having such a compact chest rig was most definitely to my benefit and a few other people were seriously sweating inside their plate carriers. I didn’t have hydration on me which seems dubious in the context, but the games were pretty short and personally I was absolutely fine come the end of the day through just drinking plenty of water during breaks and occasionally snacking on a bag of McCoys salt & vinegar. At least one guy fell down (literally) but he was in all black clothing with a black PC and I’m pretty sure a black helmet, maybe drinking coffee and/or red bull between games too, quite possibly not enough water. Also wore some Roman Kurmaz workmanship for the first time in the form of my G3 combat trousers made from the Hyperstealth/US4CES Mexican Marine fabric, though sadly hidden in the image. Discovered you really have to wear those things in the intended manner (high waisted) once you’re sweating because if they’re not a baggy fit they will cling and be inhibitive when it comes to climbing up stuff. Not that this is the trousers’ fault; I spent a couple of months in the states earlier this year eating a lot of pizza and when I did go to the gym I did quite a bit of leg work. It does give me an interesting frame of reference to see how the Gen4s end up performing by comparison in hot weather, being made entirely of stretch fabric as they are. Quality of stitching wise the report is very favourable on Roman’s work as the sticking of the fabric to me meant that the stretch segments in the design were definitely being put under strain and absolutely none of the sewing showed any hint of giving way in a post-wash visual scan later that evening. The SKD Tactical PIG Deltas did exactly what I wanted in a glove as expected, similar story for the Under Armour boxer shorts and Darn Tough Vermont Socks. I used a couple of wire pull Enola Gaye pyros for the first time as well which was a real luxury compared to striker lit pyro (thanks to Kelly for those). Stock Tokyo Marui SOCOM AR with old PTS/Magpul Industries Corp. furniture and mags just worked of course. Nothing to say about that that you won’t know already if you know anything about the platform. 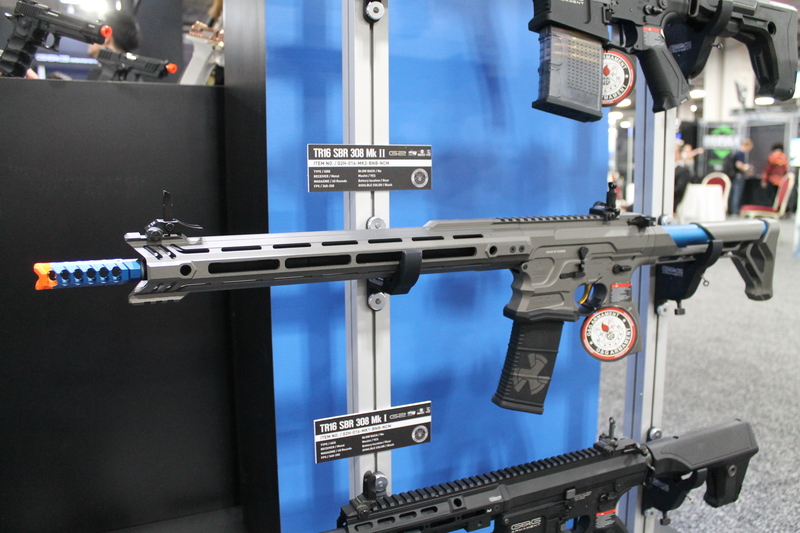 The FPS is somewhat low so to BB takes a little bit to get to where it’s going, but I love the faux bolt-lock feature and since the ROF is also pretty low short bursts are very easy to pull off consistently. Not the absolute best indoor gun when you’re set to semi, but then it and my batteries are all many years old at this point and my bar of comparative standards is also set very high.